Potato Pie — always with butter. Oven 400F. Line a baking sheet with parchment paper. Cover potatoes with water in a saucepan. Bring to a boil over high heat, add a pinch of salt. Cook until tender, 13-15 minutes then drain and cool. Bring 3/4 cup + 3 tbsp cream, garlic and nutmeg to a boil over medium/high heat in a saucepan. Cook until reduced by half, season with salt and pepper then set aside. Mix butter, scallions and parsley then season with salt and pepper. In a separate bowl, whisk yolk and remaining crew, set aside. 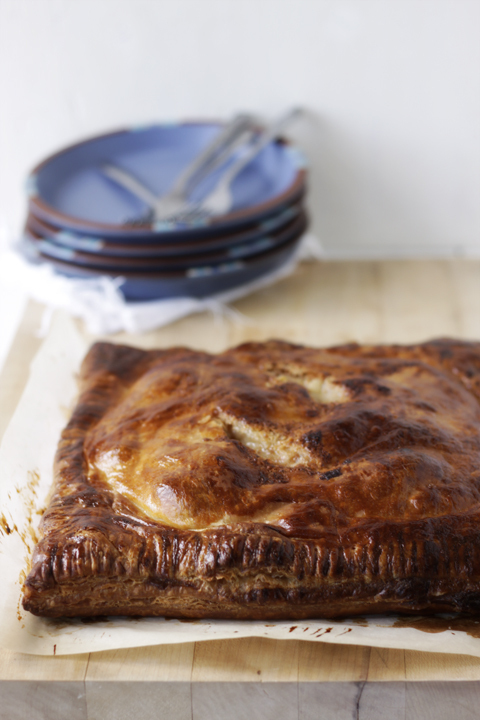 Divide puff pastry into two 6x13 inch rectangles. Place one rectangle on the baking sheet. Overlap potatoes on pastry, leaving a 1/2 inch border. Top with scallion mix and 3/4 cup cheese. Season with salt and pepper. Add a final layer of potatoes, scallion and cheese. 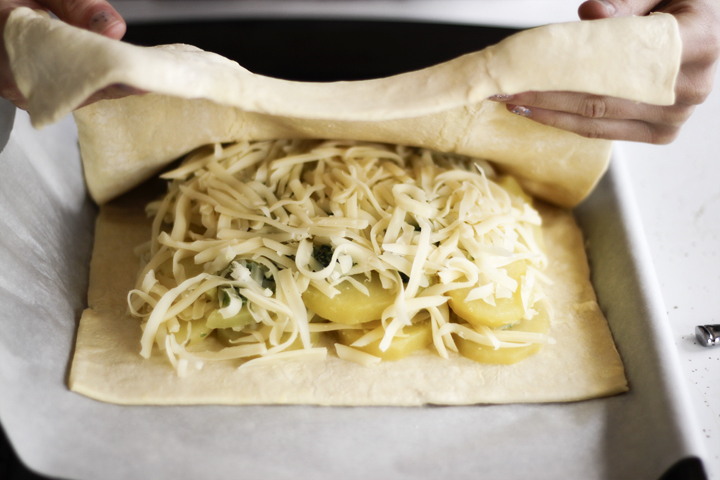 Brush edges of dough with egg wash. Cover with pastry and press edges with a fork to seal. Cut a 2 inch slit lengthwise in the center of the crust. Brush with egg wash then chill for 30 minutes. Bake until golden and puffy, 35 minutes. Pour cream mix into pie vents. Bake for 10 additional minutes then let stand for 15 minutes before serving.